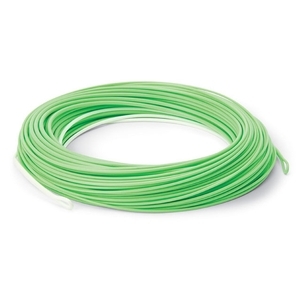 Cortland Precision SL Big Fly - 2' Dyna Tip Floating Fly Line. Just as some fish are bigger than others, some flies are bigger too. And when it gets right down to it, sending one of those big fuzzy flies sailing across the sky is half the fun. A feat that's humanly possible thanks to the aggressive front-taper and over-weighted head on our new Big Fly line. It loads quickly and throws big streamers, bass fl ies, and tandem rigs with minimal false casting. The low friction, PST™ coating shoots smoothly through the guides, and the stiff , low-memory running line resists tangling. The 2-foot Dyna-Tip™ keeps the line high and dry, and welded loops at both ends makes rigging quick and easy.